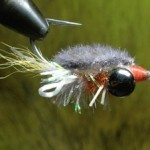 Tie on dumbbell eye leaving just enough space behind eye of hook to tie down furry foam. Tie in a little calf tail. Tie in rear of furry foam and pull up and out of the way until later. 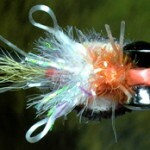 Tie in clear or pearl ice chenille and wind forward halfway to dumbbell eye and tie off. 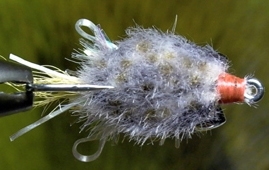 Tie in forward portion of legs (legs made by twisting a piece of flexi-floss and letting it twist around itself) on each side and wrap thread forward over tag ends to just behind dumbbell eye to form rear legs. 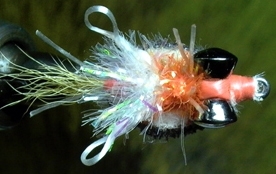 Wrap thread back to tie in point of forward legs, tie in orange ice chenille, and wind chenille forward to dumbbell eye. 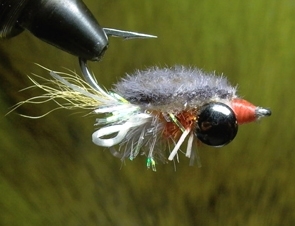 Finish this step with two wraps of chenille between rear legs and dumbbell eye before tying off behind hook eye. 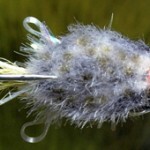 Pull furry foam forward, tie off, trim excess, and whip finish. Trim rear legs if necessary. Color furry foam with warm grey marker, and add spots with dark brown marker.